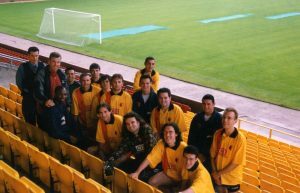 Watford IFC | The website of Watford IFC, the Watford supporters team. Members of the Internet Football Association since 1997. AN agonisingly late goal for Maidstone United’s fans team denied Watford IFC at least the shot at a cup final from the penalty spot at the end of an attritional but absorbing South-East Cup semi-final. The Stones scored with just a minute of injury-time left on the watch, breaking clear from a Hornets’ corner to convert from a low cross. It was harsh on Watford, who matched the defensive solidity shown by the visitors with a steely resolve to give few chances away on a decent morning for football at Parmiter’s School. Unusually for IFA football, defensive quality was very much to the fore as neither side managed to fashion anything more than fleeting glimpses of goal. Hornets’ player-manager Richard Walker plunged smartly to his left to push away Maidstone’s only meaningful first-half effort at goal, then easily repelled a 15-yard shot 10 minutes from time as the visitors looked to make the most of a rare second-half opening. Lamar St-Cyr scuffed Watford’s best early chance and striker Adam Gallichan hit a post with a side-footed effort as he bore down on the United goal. And debutant Dean Mitchell impressed at left-back, sending in some teasing centres as the game wore on. John Sitkowski was outstanding at the heart of the Golden Boys’ rear-guard effort, taking an inadvertent pummelling to the ribs at the hands of Maidstone’s giant centre-forward mid-way through the second 45, while the determination of Rob Stone and Max Walters in midfield was impressive. But it was the visitors who prevailed and, with Watford IFC’s best wishes, will now advance to the final to meet Millwall – who beat West Ham United 3-1 in the day’s other semi-final. Hornets: Richard Walker; Matt Ainsley, Ally Hill, John Sitkowski, Max Walters; Lamar St-Cyr, Rob Stone, Stuart Nicholls (C), Richard Murphy; Adam Gallichan, Charlie Wood. Subs used: Dean Mitchell, Ben Bateman, Ciaran Bateman. 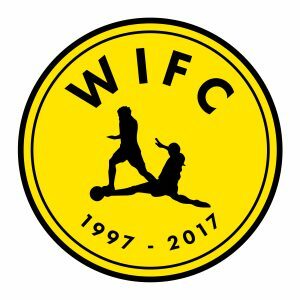 Happy 20th birthday WIFC !! 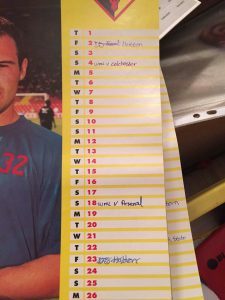 ASSUMED lost in the mist of time, the recent discovery of an old calendar in Simon Devon’s loft confirms the forgotten date of the first ever WIFC game.. 18th May 1997. That’s 20 years ago today. Further posts will follow today to mark this momentous occasion..